Few rock guitarists have proven to be as influential and enduring as the great Michael Schenker. And March will be a busy month for Schenker, as he will be issuing his latest album on the 2nd, ‘Resurrection,’ as well as launching a North American tour in support of it – kicking off on the 6th at the Fillmore in Silver Springs, MD, and wrapping up on April 3rd at the Ritz in Tampa, FL. 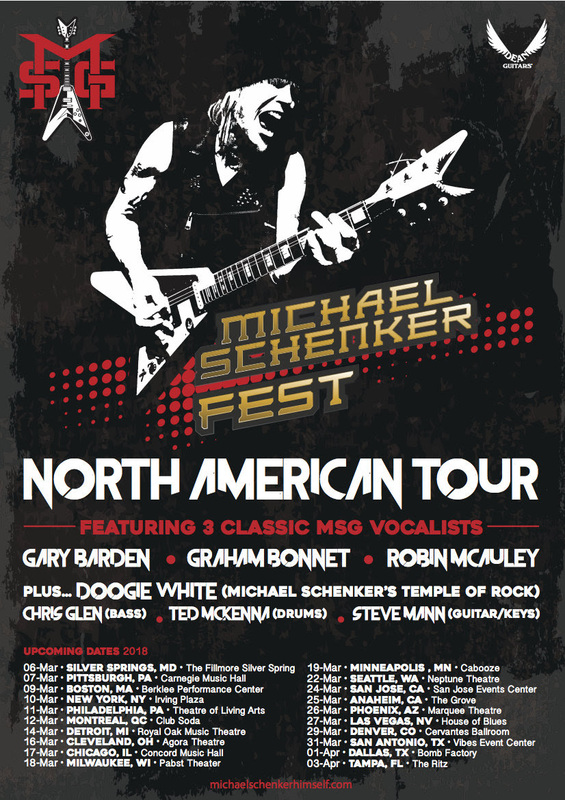 And what makes this tour truly unique is that it is being billed as “Michael Schenker Fest,” and will be featuring three classic Michael Schenker Group vocalists (Gary Barden, Graham Bonnet, and Robin McAuley), plus the singer of Michael Schenker’s Temple of Rock (Doogie White). And in addition to Schenker supplying guitar, he will be joined by second guitarist/keyboardist Steve Mann, bassist Chris Glen, and drummer Ted McKenna. Meet and greet packages are also available for purchase via michaelschenkerfest.com.